Coroico is a hill top town in the Yungas region of Bolivia and is a good place to spend a night before heading to La Paz, or further north toward the Jungle. Because of the lower elevation, the weather is quite nice by comparison to La Paz, and has a resort-like feel to it. Weekends are busier with Paceños. PUBLIC TRANSPORT: Take a minibus from the “Minasa Terminal de Buses”, near Villa Fatima, La Paz, heading to Coroico. - Cost 20-35 BOB. Journey time is 2 hours. There isn`t a schedule. The minibus or minivan leaves whenever it gets full every 15 minutes to an hour. If a driver says he's leaving in 10 minutes, he just wants you to get in his bus but he wont leave until he's full. Also, tour agencies in La Paz will always be more expensive and will try to convince you that public transport is not safe. They will tell you anything to get a booking. Public transport is a good option for an authentic locals experience and totally safe. The first bus leaves around 6am and the last at 6pm. As well, there's a Hotel Esmeralda "Express Van" - (door-to-door, peak season only). Prices: Minibuses: 20 Bs for the ticket per person - takes 14 passengers Minivan: 30 Bs for the ticket per person - takes 7 passengers. They are comfortable and faster. Alternatively, get off the highway at Yoloso and take a collectivo up the hill for 5 Bs (15 mins). 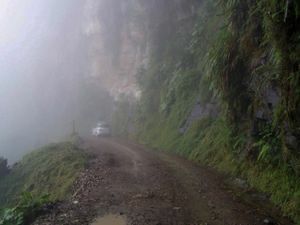 From La Paz to Coroico you can also do "The Bike Ride" - the so-called, "Death Road." Look for the agency that allows you to bring your backpack along. Most agencies rather pay $5 commission to the hotel your staying in La Paz, than to haul your luggage along. Their vans are stuffy. The most famous of these are Gravity Assisted Mountain Biking ($85 per person) and Madness Adventures' Downhill Madness ($75 per person), Calle Sagarnaga No. 339, (591-2) 2391810 . A good alternative is BarroBiking.com, Jose the owner does every ride, Calle Sagarnaga No 288, Zona Rosario, Galería las Brujas Of.10 Teléfono(s): 591)-735 10 270 (591)-2-231 5526. Another option is to contact the small Coroico agency. There are also several 2-day walks which lead you to Coroico. See 'Do' section. Coroico is a small town and just about everything is in walking distance. There are also taxis in town. 30 minutes away from Coroico there is a community project named “El Vagante” (http://www.elvagante.com) that offers canyoning and trekking for $40 to $60 per day. Canyoning involves rappelling down 8 natural waterfalls with pure, fresh, crystal clear water in the middle of the Yungas Jungle. You can also enjoy trekking through the Yungas tropics appreciating nature and fauna, breathing healthy full of oxygen air. 15 minutes from Coroico on the Yolosa river is an animal refuge and EcoLodge called La Senda Verde. They offer several different tours to see their birds, monkeys and bears as well as offering short and long term low-cost volunteering opportunities. For free trekking you can walk up to the phone masts, when you get to the church you could go left which takes you on an easy flat path toward three waterfalls (first 2 not for swimming as they are the local water supply). The views of the valley are amazing and there are lots of wild flowers and the odd coca field. You could also go right at the church to the top of the hill (the highest point in the area). The best free hike you can do is to the waterfall of Vagantes. It is a way more beautiful walk than up to the 3 waterfalls and you will probably be the only person in the valley. You start by following the road to Coripata** but the first road you encounter at your leftside after leaving the village you have to take. It is right after the big yellow house, and there is a hard-to-read sign that shows the direction to the Vagantes. This sign claims it is only a 4km walk, this is not true, in reality it is more. After this you just keep on following the road downhill for a long time. Until you reach a sign telling: "Senda del Turista". Here you take the little path at your right side and follow it downhill to the valley. When you are close to the river and encounter a road and little cabin, you go right for another 5 minutes until you reach the nice waterfalls. You can swim here at some points, just be aware of the strong current. The walk takes approx. 2 hours each way. Take your provisions, as there is no shop or person selling anything along the road. CXC  offers mountain bike tours around Coroico for beginners to experts. Lonely Planet called them "a bit disorganized, but very friendly". Office does not operate, but apparently you can email for tours. Most people just come to chill out at the pool, and at night go eat in one of the excellent restaurants. There is a large open air municipal pool (20m) above the bus terminal with space for sunbaking. You can find guides in the Tourist Information Office on the Plaza, or you can ask your hotel to recommend one. A lot of people say, that there is no ATM in Coroico. This is not true. There are 3 ATM around the main plaza. You can withdraw money there with a normal international (VISA only, not Mastercard) credit card. Try the comedor municipal for cheap food from Bs6. Pizzeria Erika has fairly cheap pizzas and pastas, but you can also go for a set meal. El Cafetal . It's an open air restauramt under a jatata roof, with an excellent view down the valley (obviously no view at night!). Expect lamb curry, llama goulash, trout lasagna and crepes amongst others. 40BS+ They are also a hotel. Best price/quality at the vegetarian Villa Bonita, also famous for its ice-cream. Hotel Esmeralda avoid! Awful food. Even worse service. Carla's Garden Pub is the true stand-out in Coroico. Coldest beer in the Yungas and the Dutch Chef really knows his stuff! BTW, the toilets are pristine! 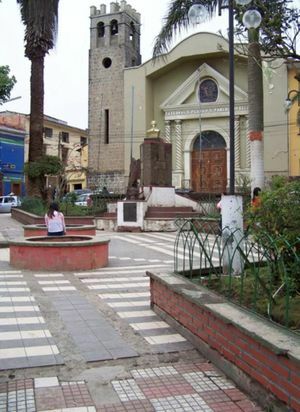 There are minibuses to La Paz from 3am to 5:30pm. These take the safe new road, but are a bit cramped. 15-18 Bs, 4 hours. For 25bs you can get the smaller/safer mini-vans 2 hours. A private taxi to La Paz should cost around 300-350 Bs. Also, there are shared taxis that cost from 25 to 35 Bs. They take the curves a bit fast, so it's best to take them only if you have a strong stomach. There are daily buses all the way to Rurrenabaque (at least 15 hours, or maybe 20! ), leaving around noon for 110-120Bs. 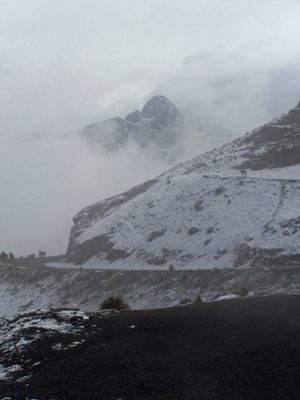 The ride to Rurre is far from comfortable and should not be done when it's rainy because the "street" goes through very mountainous areas and is not in a good condition.